Asus M2N32-SLI Deluxe is the AMD Socket AM2 motherboard based on nForce 590 SLI chipsets, and comes in two SKUs, a regular version and a with Wireless capability Edition. Asus M2N32-SLI supports AMD Socket AM2 CPUs, AMD Cool ‘n’ Quiet Technology and features bi-directional 1GHz (2000MT/s) HyperTransport interface, 46 lanes total PCI Express configuration, Scalable Link Interface Technology (SLI) for dual PCIe x16 interfaces, SATA 3.0Gbps, Gigabit Ethernet, up to 8GB using DDR2 533/667/800 DIMM sockets, RAID support, ADI SoundMAX AD1988B 8-channel HD Audio CODEC, DTS Connect support, optical and coaxial S/PDIF Output, and Firewire ports. TechSpot tests and reviews the performance of Asus M2N32-SLI motherboard, and awards Asus M2N32-SLI as Outstanding Product Award with conclusion that ASUS M2N32-SLI Deluxe is easily the best motherboard I have had the pleasure of testing this year. It is also one of the first nForce 590 SLI supporting motherboards to become available, and ASUS has done well to achieve this. With almost no design or operating flaws, the M2N32-SLI Deluxe is a truly amazing product. I feel not only ASUS, but also AMD and NVIDIA will be happy with this product and their contribution to make it such a powerful piece of hardware. With a retail value of roughly $220 the M2N32-SLI Deluxe may not be the cheapest solution around, but even at this price I could easily justify purchasing this motherboard. Hardware Secrets awards the motherboard Golden Award and concludes that M2N32-SLI Deluxe is the most high-end socket AM2 motherboard from ASUS, and it deserves the crown of the best socket AM2 motherboard around. The only bad thing about this motherboard is its price, but you won’t regret buying it. PCStats concludes with overall rating of 86% on the recommended motherboard with comment that judging by the motherboard benchmark results the Asus M2N32-SLI Deluxe is a great all round multipurpose board. It’s full of features, its got a fast chipset, and overclocks well. If the competition can keep quality, feature set and performance up to par with this example from Asus, the Socket AM2 Athlon64 will have a long and bright future ahead of it. Virtual-Hideout (dead link) writes that “If you’re thinking about buying this ASUS M2N32-SLI Deluxe, I can certainly recommend it. It will be brutal overkill for allot of you, but others it will be just perfect. Cheap it isn’t, coming in at just over $200 USD, but when you want the best you unfortunately have to pay for the best. There is not much doubt around the enthusiast community that this ASUS M2N32-SLI Deluxe is the best AM2 motherboard on the market at present time. And since I’m the editor an it’s my choice for motherboard (yes I purchased this board), then I think it more than deserves the Editors Choice Award. Phoronix tests Asus M2N32-SLI with Linux and concludes with rating of 9 out of 10 that coming out of the ASUS M2N32-SLI Deluxe testing under Linux, this is quite possibly one of the best AM2 motherboards. The M2N32-SLI Deluxe boasts NVIDIA’s flagship nForce 590 SLI Chipset, is extremely tweakable when it comes to overclocking and performance options, and ships with a wide array of accessories. Among the ASUS innovations for the MN232-SLI Deluxe WiFi is a fanless heat-pipe Chipset cooling system and integrated 802.11g wireless adapter. Some of the other new items introduced with this AM2 product were an ASUS array microphone and Q-Connector kit. When it comes to the motherboard itself it offers dual Gigabit LAN, IEEE-1394a Firewire, dual RAID, and SATA on the Go capabilities. The overclocking results were nice and it certainly was stable throughout our tests. When it came to the Linux compatibility with the ASUS M2N32-SLI Deluxe WiFi, the integrated WiFi-AP Solo 802.11g had not worked natively nor did LM_Sensors properly detect the hardware sensors. 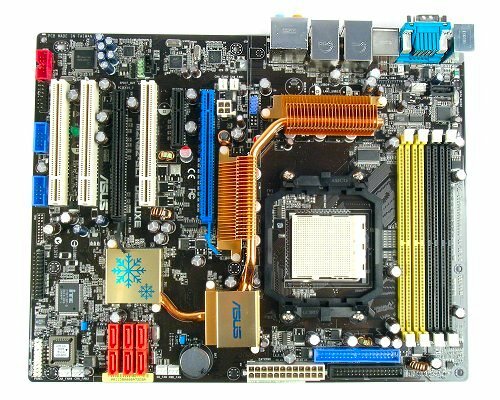 Other then those two anomalies the motherboard had fared quite well with Linux compatibility, and its performance was certainly competitive. For those enthusiasts after top-notch performance with Socket AM2, the ASUS M2N32-SLI Deluxe should certainly be towards the top of the list.